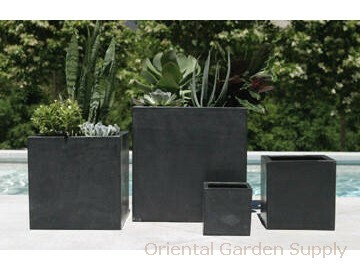 Product Information : Set of 4 black square shaped planters/landscaping bowls are frost resistant and durable. Made of Terrazzolite, crushed stone and hidden layers of fiberglass that are finished to look like terrazzo or stone - but much lighter. Smallest square measures 8inx8inx8in, next smallest measures 12inx12inx12in, medium bowl measures 15.5in x15.5inx15.5in, and the largest measures 20.5inx20.5inx20.5in.